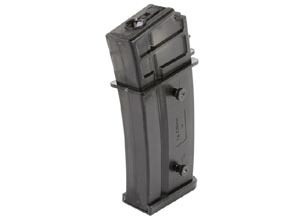 This is the high capacity 470-round magazine for use with the Echo 1 G36C airsoft rifle. Easy to fill, just pour in 470 rounds through the top hatch. Easy winding spring dial on the bottom keeps tension on the ammo for smooth feeding. Best of all these are absolutely perfect in look and feel.